National Human Rights Commission has published a Job Circular today. In this post, we are going to describe the National Human Rights Commission NHRC Job Circular 2019. As per this Government Job Circular March 2019 of NHRC, We have found a total of 15 Job Vacancies under 4 Job Posts. The Authority has declared that only Selected Form-based Application will be marked as valid. So, the eligible candidates must need to download the Official Form from www.nhrc.org.bd. The Application Form Submission is processing and it will continue till 15 April 2019. The Applicant can send their Application Form with all Necessary Documents via Courier Service, Post Office or directly to the Office Address of National Human Rights Commission. Let’s read the below Circular and Apply for this Job Today. 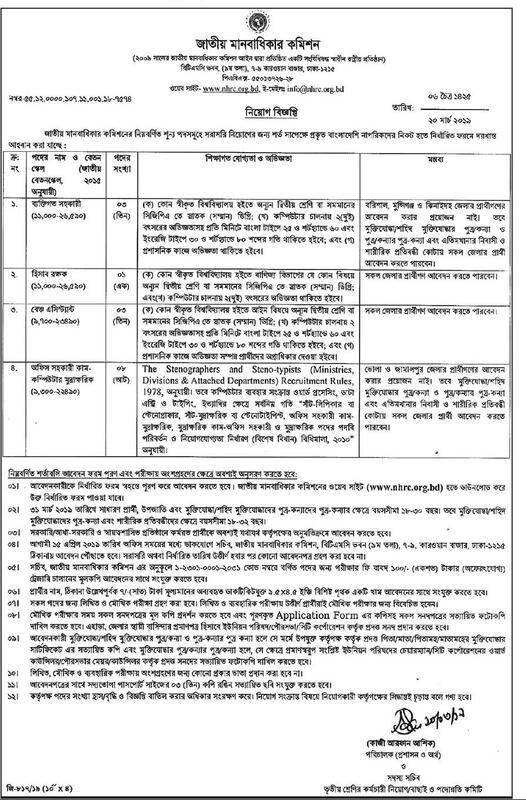 Another Job Circular has published today by the Government of Bangladesh that is MPA Job Circular 2019. Here is the official Job Circular of National Human Rights Commission. We have added the Official PDF Job Circular as HD Image Version which published on the Newspaper and Online Job Portals. So, Read the Circular completely from the below or Download the Circular now if you want to read the circular later. There is the Contact information of National Human Rights Commission (NHRC) available on the Top Section of the Circular. You can contact the Authority to know about the Circular and other Information. All necessary Information like the Post Name, Job Vacancies, Salary, Receiver Address, Application Deadline, and all other information is available on the Circular. So, Read the Circular again and apply now.